Conditions at Heywood Road were perfect for a fast open rugby match and the small crowd were not disappointed. After a promising start, a loose kick from Wharfedale was collected by Paulo Odogwu who outpaced the covering defence and put Ciaran Connolloy in at the corner – Liam McGovern added the extras. Wharfedale were then awarded a penalty which Tom Barrett duly converted to make the score 7-3. The next 13 minutes saw Sale have a purple patch and run in tries from Chris Johnson, Ollie Longmore, Paulo Odogwu, all of which were converted by the impeccable Liam McGovern, making the score 35-3. Immediately from the re-start Tom Barrett intercepted a pass in Wharfedale’s half and raced the length of the pitch for a try which he converted. This gave the travelling supporters hope but a period of scrappy play saw both Rob Baldwin (high tackle) and Adam Aigbokhae (technical) sent to the bin for 10 minutes. From a lineout, and through multiple phases, Ciaran Connolloy crossed the line again, converted out wide by Liam McGovern. 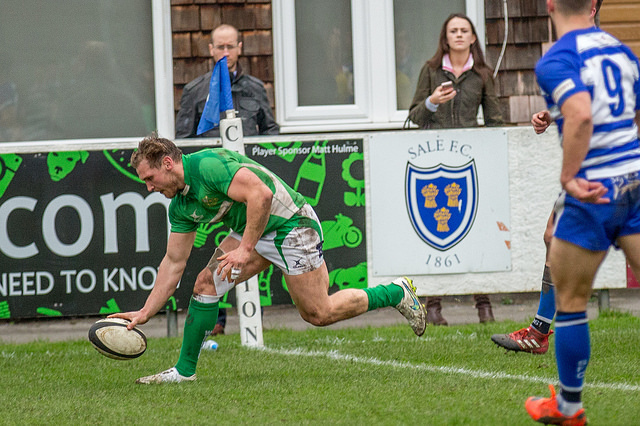 Wharfedale won a scrum in their own half and Scott Jordan made a break and held off several Sale defenders to score a good try, converted by Tom Barrett , leaving the score 42-22. The final quarter was all Sale and tries by Jack Moorhouse(2),Liam McGovern, all converted by Liam McGovern giving him a 100% record from the tee. 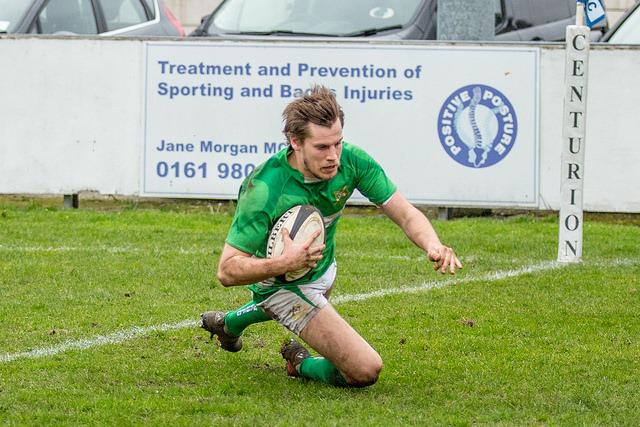 Then in 80th minute, the never say die Wharfedale, attacked out wide and Robbie Davidson went on to score the losing bonus point try. The conversion was missed by Tom Barrett, leaving the final score 63-27. A very entertaining game in which Sale displayed some scintillating running rugby and an outstanding performance from Sale Sharks Academy player Paulo Odogwu. Their pace and off-loading the ball in contact was difficult for Wharfedale to counter but the Green Machine stuck to its guns and gained a valuable losing bonus point .That now leaves them in 11th place in the league , equal on points with Otley and eight points clear of Harrogate. The real disappointment of the day was Josh Burridge being helped off the field with a knee injury which could side line him for the last five league matches and certainly ruin his ski-ing holiday booked for next week.